Christmas Ornaments Made in USA - 2009 Capitol Ornament - A Christmas Ornament Co.
or perhaps hanging from a mantle piece. "The People's Tree" (the Capitol Christmas tree) has been documented back to 1919 but it wasn't until 45 years later in 1964 that a definite procedure/lighting ceremony was adopted. Elegant in its simplicity (although ornately detailed on the 24k gold-plated border), the ornament is made with marble which was removed from the original steps for the House of Representatives in 1995 (due to the wear and tear created by the over nine-thousand representatives who used the steps dating back to 1863 to 1865). The original marble was crushed and combined with a polymer resin to create this heirloom ornament. 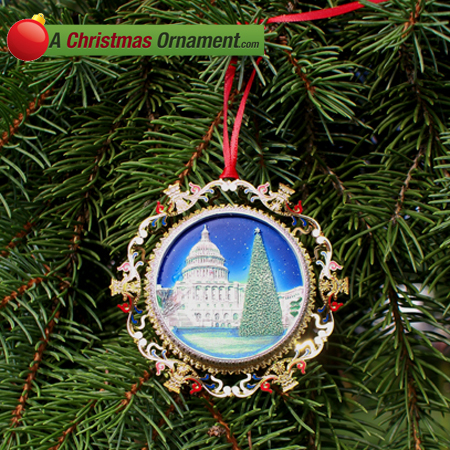 This ornament features a three-dimensional drawing/painting of the Capitol building with a grand Christmas tree beside her and is finished in 24 karat gold.